Why Multi-Talented Musicians, Shouldn’t Shy Away From Their ONE THING. If you’re used to providing artists, producers, musical directors and students with a variety of options, it can be tough to know how to stand out when you are looking for more gigs or moving up a level. Professional guitarist James Pusey came to me because he wanted to update his website, but he wasn’t sure where to start. He had an old Wordpress site, but it wasn’t mobile friendly and it was out of date. Using the Freelancer-90 Package, I worked with James to help him create a new site for his audience. James has a great reputation and his phone will continue to ring - website or not. So a new site needed to enable him to have more control over his diary. James worked 1-2-1 with me via a few Skype calls and a very active ‘Slack’ channel, to maintain focus. He also worked though the ‘Find Your People’ and ‘Your Website’ videos in the member's area of ‘The Business of Music’. James’ hidden gem is that he has spent a long time studying and playing Sitar, not only in the UK but also in India. With that in mind, James worked hard on presenting himself as a Sitar player and teacher for guitarists who were looking to discover more about the instrument. He’s created a ‘lead magnet’ (free download) that gives value quickly to people interested in learning more about Indian music. The same free download also gives James permission to contact people who have downloaded it. ‘Lead with the giving hand’. 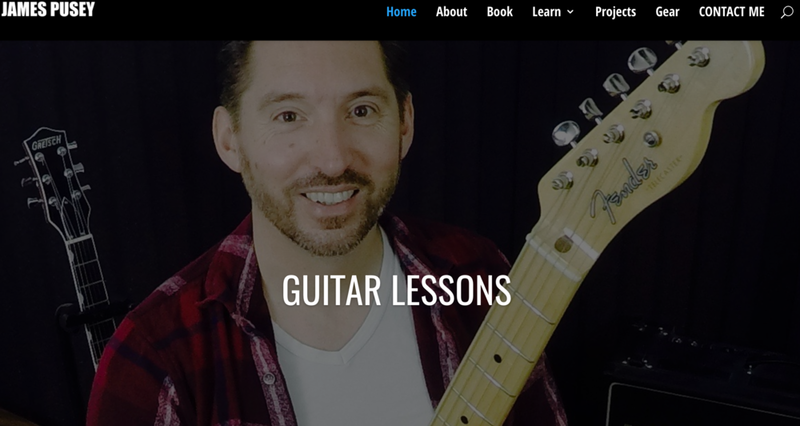 James will always be called as a guitar player who can cover all bases, but it strikes me that where his website will help him get work from new clients, is where he shows how he is different. And of course, once the people who have hired James to play/teach Sitar find out he can play Guitar, that’s where James removes all competitive elements and creates a space just for him in the market. What is the one thing that makes you different? Are you leading with it? How could that make a difference to your life? You can check out James Pusey at www.jamespusey.com and you can find out more about how I can help you by getting in touch HERE. How Musicians Are Taking Ownership Of Their Market By Giving First!